November 16, 2014 (San Diego’s East County) –Citizen's Oversight and the law firm of Aguirre & Severson have filed a Federal lawsuit against two top public utility officials and Southern California Edison (SCE) for allegedly violating the constitutional rights of SDG&E ratepayers and SCE ratepayers by taking over $3 billion without just compensation. April 6, 2014 (San Diego’s East County)—The future of the East County Performing Arts Center, whether Alpine parents should be free to leave the Grossmont district, and whether a fire district should be able to declare most native vegetation as nuisance or not are among the hot items on East County agendas this week. Click “read more” and scroll down for these and other important items being heard this week. 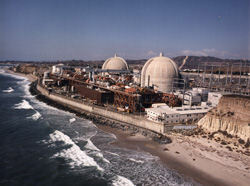 November 26, 2012 (Washington D.C.)-- The U.S. Nuclear Regulatory Commission, Atomic Safety and Licensing Board (NRC) has ordered that oral arguments be heard at 1:00 pm EST on Wednesday, December 5 from Citizens' Oversight (COPS) and Southern California Edison (SCE) regarding a license amendment request by SCE for the San Onofre Nuclear Generating Station.